Primary texts (Pseudepigrapha, Targum, Midrash, Targum) about Messainic Expectation. Primary texts about the Judean-Samaritan Feud and Samaritan Theology. Comparative primary texts about Purity and Social Relations (see esp "Sin Causes Sickness," from Mishnah, Midrash, Tosefta, and Babylonian Talmud. At Mahlon H. Smith's (Rutgers University) Into His Own: Perspective on the World of Jesus. From Augustine's Tractates on John: Tractate XV (4:1-42). HOMILY XXXII. John 4:13, 14 by St. John Chrysostom. "Christ, leaving the proud Pharisees, communicates the treasures of everlasting life with a poor sinful woman and stranger, refuting the gross errors of the Samaritans, and defending the true service of God, which was delivered to the Jews, but yet in such a way that he here calls both Samaritans and Jews back to himself, as one whom only all the fathers, and also all the ceremonies of the law, regarded, and had respect for." "No past sins can bar our acceptance with him, if we humble ourselves before him, believing in him as the Christ, the Saviour of the world." "But she might the more easily mistake his meaning, because living water was a common phrase among the Jews for spring water." "The antipathy between the Jews and Samaritans was so bitter that they were never wont to ask any hospitable rite. The woman's reply is not a refusal of the Lord's request, but an expression of astonishment that a Jew should ask a favor of a Samaritan." Commentary, John 4:5-42 (Lent 3A), Osvaldo Vena , Preaching This Week, WorkingPreacher.org, 2017. "John 4 represents the founding narrative for the presence of a considerable number of Samaritans in the Johannine community." "Holy Conversations," Karoline Lewis, Dear Working Preacher, 2017. "The Nasty Woman Who Persisted: The Samaritan Woman of John 4," Jaime Clarkk-Soles, ON Scripture, 2017. "The Woman at the Well," Dan Clendenin, Journey with Jesus, 2017. "The Rewards of Encounters," Melissa Bane Sevier, Contemplative Viewfinder, 2017. "Still Thirsty," Andrew Prior, 2017. "Adultery," Nancy Rockwell, The Bite in the Apple, 2017. "Jesus and the Samaritans," Janet Hunt, Dancing with the Word, 2017. "Spirit," Frederick Buechner, Buechner Blog. "The spirit of God, Holy Spirit, Holy Ghost, is highly contagious. When Peter and his friends were caught up in it at Jerusalem on Pentecost, everybody thought they were drunk even though the sun wasn't yet over the yardarm (Acts 2). They were." Jesus and the Woman of Samaria, audio telling, story in episodes, graphic, audio and written commentaries. Go Tell Communications, Biblical Storytelling for the Global Village, 2011. Misogyny, Moralism and the Woman at the Well, David Lose, The Huffington Post, 2011. "She is not a prostitute. She doesn't have a shady past. Yet when millions of Christians listen to her story this coming Sunday in church, they are likely to hear their preachers describe her in just those terms "
Commentary, John 4:5-42 (Lent 3A),Meda Stamper , Preaching This Week, WorkingPreacher.org, 2011. "This text suggests in a number of ways that it is not about what we know but who we know." "Our language about what God offers: justification, sanctification, forgiveness, grace, etc., may be just as confusing to the world as "living water" was to this woman (or "born from above" was to Nicodemus). What will "speak" to this woman? What will speak to the unbelieving world? How do we help the world know what to ask for?" "High Noon at Jacob's Well," Peter Woods, I Am Listening, 2011. "Isn’t that all any of us need for our healing? A space,unbearably hot as it might be, where we can allow ourselves to acknowledge who we are, and in that moment be graced by a Saviour who does not turn away from our shame and failure, but who floods our failed lives with his quenching living water..."
Quench Your Thirst, Bruce Epperly, Patheos, 2011. Lectionary Blogging, Lent 3, John Petty, Progressive Involvement, 2011. "The 'husbands' are symbolic. After their conquest of the region in 722 BC, the Assyrians took about 30,000 native Israelites out of the region and imported people from Babylon, Cuthah, Avva, Hamath, and Sepharvaim (2 Kings 17:24) into Samaria." Holy Textures, Understanding the Bible in its own time and in ours, John 4:5-42, David Ewart, 2011. "A good title for a sermon this week would be, "The Other Good Samaritan." The unnamed woman who grows from a shunned outsider to an evangelist." "Thanking the Woman at the Well," Unvirtuous Abbey, The Hardest Question, 2011. "Who's the thirsty one here?" "The Secrets We Keep," Reflections on John 4:1-30, Alyce McKenzie, Edgy Exegesis, Patheos, 2011. "Our new life begins when we finally recognize the identity of the man at the well." "Living Water, Living Story," David Lose, WorkingPreacher, 2011. First Thoughts on Year A Gospel Passages in the Lectionary: Lent 3," William Loader, Murdoch University, Uniting Church in Australia. "This wonderful piece of drama has many levels of meaning. As always in John its central character is God and God?s gift of life through the invitation to live in the holy space of love, the true worship in the Spirit, which is also the living space of the Father and the Son. That love, embodied, cuts across racial and cultural prejudice, affirms women, engages and loves sinners." "The Water of Life,"Rev. Bryan Findlayson, Lectionary Bible Studies and Sermons, Pumpkin Cottage Ministry Resources. Includes detailed textual notes. Commentary, John 4:5-42, Karoline Lewis, Preaching This Week, WorkingPreacher.org, 2008. Dylan's Lectionary Blog, Lent 3, 2005. Biblical Scholar Sarah Dylan Breuer looks at readings for the coming Sunday in the lectionary of the Episcopal Church. "What transformed this woman could transform our world. The woman at the well was despised by her village, which was despised by Judeans, whose ancestors had been humilated by Babylonians. From generation to generation, humilation, resentment, and violence were passed down by people keeping the score so that they could seek to even it. Jesus sets aside all score-keeping, and by treating all as if all were forgiven, he makes forgiveness possible -- even for self-righteous sinners like us." "The Woman at the Well: Third Sunday in Lent 2008," The Journey with Jesus: Notes to Myself, Daniel B. Clendenin, Journey with Jesus Foundation, 2008. "The kingdom that Jesus announced is not one of a privatized faith whose purpose is to guarantee personal peace and affluence." "The Woman at the Well," Gospel Analysis, Sermons from Seattle, Pastor Edward F. Markquart, Grace Lutheran Church, Seattle, Washington. Detailed background and exegesis. "The testimony of another person may get your attention initially, but ultimately, the Spirit of Christ works in one?s own life in a unique way." "Second Sunday in Lent: John 4:54-42," New Sight, New Life: Lenten Gospels, Gracia Grindal, Word & World: Theology for Christian Ministry, Luther Northwestern Theological School, 1996. "Discipleship in John: Four Profiles," Mark F. Whitters, Word & World: Theology for Christian Ministry, Volume XVIII, Number 4, Luther Northwestern Theological School, 1998. "Reviewing Jesus' encounter with four potential disciples in John's Gospel can help us understand our own discipleship -- potential and real." "No God but God," study guide for adults, Robert B. Kruschwitz, (other resources at) "Christianity and Islam," Christian Reflection, The Center for Christian Ethics at Baylor University, 2005. Lectionary Commentary and Preaching Paths (Lent A3), by Jirair Tashjian, at The Christian Resource Institute. "Has the church really done all that it could to take on the issue of racial prejudice? What about prejudice based on gender and economic status? How ready is the church to minister to people whose morality does not measure up to the church?s standards?" "Conversing about the Wellspring Within," Larry Broding's Word-Sunday.Com: A Catholic Resource for This Sunday's Gospel. Adult Study, Children's Story, Family Activity, Support Materials. "When was the last time you got in a conversation with a stranger? What was the conversation about?" "A Divine Engagement," Scott F. Hunter, in Kerux: The Online Journal of Biblical Theology (Reformed). "It was earlier noted that Jesus had to pass through Samaria because of a divine engagement. But this engagement was more than just an appointment for Christ; it was a wedding engagement for the woman. It was an engagement of the most profound and holy matrimony, that between Christ and his Church." "The Manifestation of the Messiah to the Samaritan Woman," by Robert Deffinbaugh at the Biblical Studies Foundation. Allison, Dale C., Jr., "The Living Water (John 4:10-14; 6:35c; 7:37-39)," St. Vladimir's Theological Quarterly, 1986. Beck, David R., "The Narrative Function of Anonymity in Fourth Gospel Characterization," Semeia, 1993. Bridges, Linda McKinnish, "John 4:5-42, Between Text and Sermon," Interpretation, 1994. Brown, Raymond E., S.S., "Roles of Women in the Fourth Gospel," Theological Studies, 1975. Bull, Robert J., "An Archaeological Context for Understanding John 4:20," Biblical Archaeologist, 1975. Chappuis, Jean-Marc, "Jesus and the Samaritan Woman: The Variable Geometry of Communication," Ecumenical Review, 1982. Clader, Linda, "One Water Washes Over Us All," The Living Pulpit, 2005. Collins, C. John, "John 4:23-24, 'In Spirit and Truth': An Idiomatic Proposal," Presbyterion, 1995. Craddock, Fred B., "The Witness at the Well," The Christian Century, 1990. Derrett, J. Duncan M., "The Buddhist Dimension of John," Numen, 2004. Dockery, David S., "Reading John 4:1-45: Some Diverse Hermeneutical Perspectives," Criswell Theological Review, 1988. Dube, Musa W., "Reading for Decolonization," Semeia, 1996. Farmer, Craig S., "Changing Images of the Samaritan Woman in Early Reformed Commentaries on John," Church History, 1996. Farris, Patricia, "Unlikely Messenger," The Christian Century, 2002. Grindal, Gracia, "New Sight, New Life: Lenten Gospels," Word & World, 1996. Gundry-Volf, Judith, "Spirit, Mercy, and the Other," Theology Today, 1995. Kilpatrick, G.D., "John 4:41, PLEION or PLEIOUS," Novum Testamentum, 1976. Koester, Craig R., "'The Savior of the World' (John 4:42)," Journal of Biblical Literature, 1990. Lamkin, James E., "'Location, Location, Location': A Homiletic Exegesis of John 4," Review & Expositor, 1999. Lischer, Richard, "Strangers in the Night," The Christian Century, 1999. Maccini, Robert Gordon, "A Reassessment of the Woman at the Well in John 4 in Light of the Samaritan Context," Journal for the Study of the New Testament, 1994. Malcolm, Lois and Janet L. Ramsey, "On Forgiveness and Healing: Narrative Therapy and the Gospel Story," Word & World, 2010. Margalit, Natan, "Fountain of Life, River of Light," The Living Pulpit, 2005. McKnight, Scot, "Spiritual Snobs," The Christian Century, 2005. Milgram, Goldie, "Water as a Portal to Sacred Consciousness," The Living Pulpit, 2005. Moore, Stephen D., "Are There Impurities in the Living Water that the Johannine Jesus Dispenses? Deconstruction, Feminism, and the Samaritan Woman," Biblical Interpretation, 1993. Munro, Winsome, "The Pharisee and the Samaritan in John: Polar or Parallel?" Catholic Biblical Quarterly, 1995. Neyrey, Jerome H., S.J., "Jacob Traditions and the Interpretation of John 4:10-26," The Catholic Biblical Quarterly, 1979. Okure, Teresa, "Jesus and the Samaritan Woman (John 4:1-42) in Africa," Theological Studies, 2009. Painter, John, "Quest Stories in John 1-4," Journal for the Study of the New Testament, 1991. Rodríguez, José, "The Challenge of Hispanic Ministry (Reflections on John 4)," Currents in Theology and Mission, 1991. Sheeley, Steven M., "'Lift Up Your Eyes': John 4:4-42," Review & Expositor, 1995. Sloyan, Gerard S., "The Samaritans in the New Testament," Horizons, 1983. Taylor, Barbara Brown, "Face to Face with God," The Christian Century, 1996. Thomas-Smith, Karen, "Seeing through the Eyes of Our Sister, Hagar: An Expository Sermon on Genesis 16:1-16, 21:1-21 and John 4:5-14," Review & Expositor, 2008. Waweru, Humphrey Mwangi, "Jesus and Ordinary Women in the Gospel of John: an African Perspective," Svensk missionstidskrift, 2008. Wedel, Alton F., "John 4:5-26 (5-42), Expository Article," Interpretation, 1977. Whitters, Mark F., "Discipleship in John: Four Profiles," Word & World, 1998. "He Gets Me!" the Rev. Dr. David Sapp, Day 1, 2011. "Showing of Love," Dr. Angela Bauer, Episcopal Divinity School, 2003. "Living Water," Pastor Edward F. Markquart, Grace Lutheran Church, Seattle, Washington - Sermons from Seattle. "Give Me a Drink," the Very Rev. Samuel G Candler, Day 1, 2005. "Of Wintry Mornings and Water Wells," the Rt. Rev. J Neil Alexander, Day 1, 2002. "Re-programming Life," the Rev. Ruben Duran, Day 1, 1996. "The Woman at the Well," Illustrating the Story (lessons, children's sermons), coloring pages, activity sheets, crafts, children's songs. MSSS Crafts. "Woman at the Well," Fr. Max Bowers, Kid's Church. "Dying for a Drink!" and "The Thirst Quencher," Charles Kirkpatrick, Sermons4kids.com. "Jesus Talks to a Woman by a Well," Sunday School Lessons: Family Bible Study, art projects, music, stories, etc. "Jesus by the Well," Jim Kerlin, childrensermons.com. "The Woman at the Well," children's study, puzzles, coloring sheet, etc. Higher Praise Christian Center. Samaritan Woman Word Search, Samaritan Woman Maze, sermons4kids.com. "In a Samaritan Village," from A Certain Jesus by Jose Ignacio and Maria Lopez Vigil. Ideal for catechetical and liturgical dramatization of today's gospel. Claretian Publications. "The Woman of Samaria," Andy Lund, dramatix. "Women Unlimited," Peter Marshall, dramatix. "The Water of Life," Marjorie Kennedy, dramatix. "Woman at the Well" monologue, Ross Olson. "Woman at the Well,"YouTube video monologue, 2010. Clip Art, John 4:14, Fr. Richard Lonsdale, Resources for Catholic Educators. John 4:5-42, Lectionary Clipart, Hermanoleon Clipart. Clip Art Images: John 4:5-42, Misioneros Del Sagrado Corazón en el Perú. John 4:5-42, at Cerezo Barredo's weekly gospel illustration. Liberation emphasis. Woman at the Well Clip Art. Anglican Diocese of Dunedin, New Zealand. John 4:14, John 4:14, John 4:14, John 4:24, Heartlight - Free Christian PowerPoint Backgrounds. 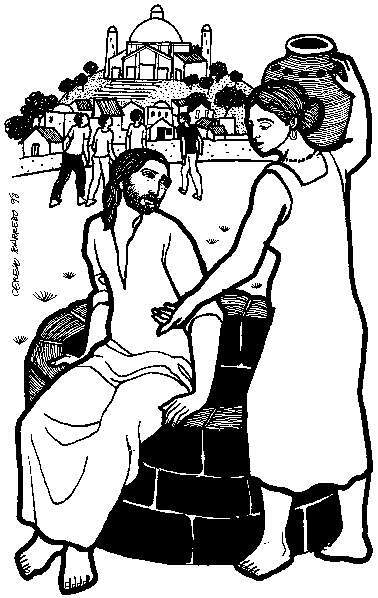 Clip Art: Jesus and the Samaritan Woman, Julius Schnoor von Carolsfeld woodcuts, World Mission Collection, Wisconsin Evangelical Lutheran Synod. The Water God Gives Us Text: Carolyn Winfrey Gillette, Tune: FOUNDATION 11.11.11.11 (“How Firm a Foundation”) A new hymn based on John 4:5-42 that was written for The Presbyterian Outlook magazine for Lent 2011 and available with the music. "O Lord, You Called Disciples,"Text: Carolyn Winfrey Gillette, Tune: LANCASHIRE 7.6.7.6 D (“The Day of Resurrection”). This hymn celebrates the woman at the well as an early evangelist. Hymns with Scripture Allusions: John 4:14, 23, 24, 35, 37. The Cyber Hymnal. The Billabong, by Rev Jeff Shrowder, Uniting Church in Australia: scroll down for hymn suggestions. "He Lingers Still," TEXT: Mark Ryman (2005) based on John 4:5-42. TUNE: "Russia." New Hymns for the Lectionary.